BEVERLY HILLS — There are people in my family who think it's funny that I write about television, because they remember me as the kid who liked to read in front of the TV. Good thing, too, because reading has always been part of the job. Television brought me to Diana Gabaldon's Outlander novels, to George R.R. Martin's (still) unfinished series A Song of Ice and Fire, and to Tom Perrotta's The Leftovers, and regularly gives me an excuse to revisit writers like Margaret Atwood, whose The Handmaid's Tale has been scaring me silly since the 1980s. I always have at least two books open on my Kindle, and at the moment, both of my bedtime reads — Elena Ferrante's My Brilliant Friend, the first of her Neapolitan Novels series, and Janice Y.K. Lee's The Expatriates — are on their way to TV. Thanks to the success of Emmy-winning series from books like HBO's Game of Thrones and Big Little Lies, and Hulu's The Handmaid's Tale, and to the ever-expanding TV universe's demand for more stories, the reading list only gets longer. I know it sometimes looks as if TV's run out of ideas, but even if recycling past hits always worked, I'm not sure there are enough to meet the demand. Podcasts are emerging as a source of material, and I'm looking forward to the Nov. 2 premiere of Amazon's Homecoming. Produced by Washington Township High School graduate Sam Esmail of Mr. Robot fame and starring Julia Roberts, it's based on a scripted thriller from Gimlet Media. I'm just not sure there are many podcasts so well suited for TV drama. Maybe that's why books, and the people who write and adapt them, are a major focus of this summer's meetings of the Television Critics Association. It's not just that PBS was there promoting its Great American Read program, in which Meredith Vieira leads a look at the books in contention to become America's best-loved novel — please don't let Fifty Shades of Grey beat To Kill a Mockingbird, people! — it's that there's a recognition that stories that have already proved their ability to engage readers can be solid bets. "The book was a page-turner and the script is as well," Amazon Studios chief Jennifer Salke said in announcing that the streaming service had ordered a series based on Lee's Hong Kong-set The Expatriates from Nicole Kidman's Blossom Films. "I've invested in those characters. I want to know more about those worlds. So, for me, I feel a bit of an insurance policy of, moving forward, I know this is a really rich pool of character stories and tension," Salke said. The streaming service probably gets three or four pitches a week based on books, "and it's just great source material for what we're trying to do," said Amazon TV co-head Vernon Sanders. It doesn't hurt that Amazon also famously sells books: "Every time we … mention a book property that we're developing, those book sales spike as well," Sanders said. "I think they love having a sense and holding something that exists, that you're going to translate into television or a movie," Jack Bender, an executive producer of AT&T Audience Network's Stephen King adaptation Mr. Mercedes, said about how programmers respond to pitches involving books. "I think that it makes them feel secure in a way." Raelle Tucker, creator of the new Facebook Watch drama Sacred Lies, optioned Stephanie Oakes' book The Sacred Lies of Minnow Bly without knowing where it might end up, and she said she's not sure its having been a well-received young-adult novel made it easier to sell. "I was trying to develop a 10-episode show about a girl with no hands. And the book is really fabulous and amazing and critically acclaimed, but not a humongous best seller. So I think the fight was going to be there regardless," Tucker said. "Having the book helped so much because … I could come in and talk about the show in a way that I never could have talked about it had I just been conceiving this in one script alone. I could walk in and say, 'Here's the arc of this character, beginning, middle and end,' with such certainty and such specificity." 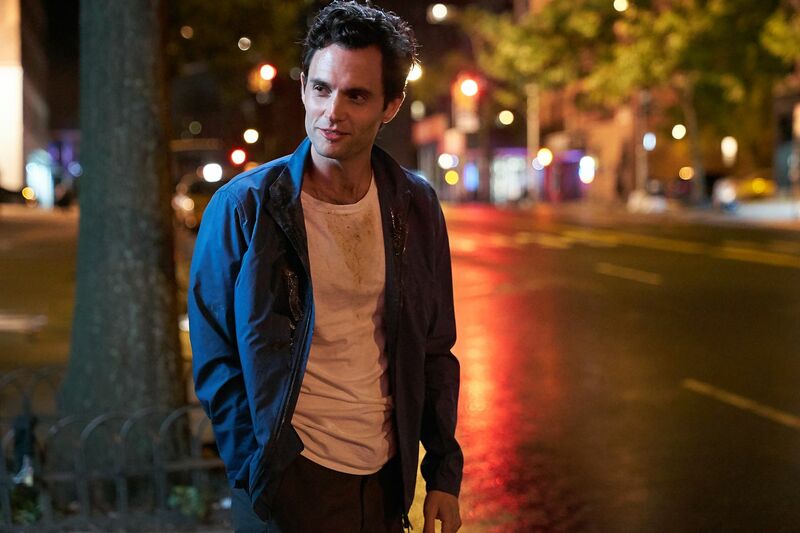 On Sept. 9, Lifetime premieres You, a new thriller based on a novel by Caroline Kepnes that stars Penn Badgley (Gossip Girl) as a bookstore employee who cyberstalks a female customer with unsettling consequences. But the women-focused network's interest in books doesn't stop there. Lifetime is planning 75 new movies for 2019, executive vice president Tanya Lopez told reporters. That's a lot of stories. "We're sort of creating these movies in trilogies and series. So we've been optioning books," she said, including some by best-selling writer Jane Green, whose novels Tempting Fate, To Have and to Hold, and Family Pictures will be a three-movie series. The network's also revisiting, for better or worse, the work of V.C. Andrews (Flowers in the Attic). "Those disturbing families are back," Lopez said cheerfully. "We're doing all five books of the Casteel family series [starting with Heaven] … Disturbing family dynamic — we're good at that." The network's also again teaming with megachurch pastor and producer T.D. Jakes (Faith Under Fire), this time on an adaptation of Victoria Christopher Murray's Seven Deadly Sins series, Lopez said, starting with movies based on Lust, Envy, and Greed. Some authors are more involved than others in the TV projects they've inspired. Gillian Flynn, the Gone Girl author whose first novel, Sharp Objects, is now an HBO drama starring Amy Adams, told reporters she "wrote or co-wrote three of the episodes and was in the writers' room every day. So it wasn't just, you know, handing over my baby." The director of My Brilliant Friend, Saverio Costanzo, has never met the book's author, who writes under a pseudonym and whose identity remains a mystery even to him. "Elena Ferrante, we have been mailing to each other since the beginning," Costanzo said of the correspondence that went through her publisher. In their collaboration on what will be HBO's first foreign-language show (with subtitles), "she was not defending the novel she wrote. She was just trying to guard us from making mistakes. She is, in my opinion, a very good scriptwriter," he said, adding that it was like working "with a ghost." No one's likely to say that of Outlander's Gabaldon, who for years turned down offers to adapt her time-travel saga before finding the right fit with Starz, where the fourth season will premiere in November. Ninety-five percent of her suitors, she estimated, had never made a movie — "they just think they'd like to start with yours" — and of the rest, most "have not read your book; they just want it because it's a best seller," or in at least one case, had read it but suggested changes she considered unacceptable. Still, "control doesn't enter into it," once the story's sold. "They're never going to give you control over something like that, and they're right now to do that." Gabaldon does like to be involved and is a consultant, "which means that they show me the script outlines, they show me the scripts, they show me the revisions to the scripts, they show me the daily footage that they shoot, they show me every part of the episodes as they are edited and reedited. So I see everything and I'm allowed, if not encouraged, to comment and suggest things all the time." Simon and Stephen Cornwell, the sons of pseudonymous author John le Carré, are overseeing production of his novel The Little Drummer Girl for a forthcoming AMC limited series, as they did for The Night Manager. Working with something by a family member is "probably more satisfying when you get it right and more dangerous when you don't," Simon Cornwell said. Le Carré, 86, at work on his next novel, "is always ready to take the book as the starting point. … Our role as we put the show together is categorically to discover fresh and exciting ways to tell the story in a new medium," Cornwell said. Demand or not, the path from page to screen is far from clear. Angela Nissel, a co-executive producer of TBS's Tracy Morgan comedy The Last O.G., grew up in Philadelphia and graduated from the University of Pennsylvania. She's published two memoirs, The Broke Diaries and Mixed: My Life in Black and White, both of which Halle Berry has optioned. She's also had her work optioned by Oprah Winfrey's production company, Harpo, and more recently by a friend, she said. "It's been all over the place. I've made more money off of people optioning [books] than I actually did off of Random House," said Nissel, who got her start in TV writing for Scrubs. "Most people who get their books optioned — they never make it to TV or film. It's just someone having a hold on it." Of The Broke Diaries, she said, "It's been out there since 2001. At this point … it would be better for me to just do it myself, since I've … proven that I can actually write TV."